Ah, the good old days – when your ancient great-aunt would sit the whole family down for a two-hour slideshow on her most recent Florida vacation. The slideshow has since gone out of style, what with the ready availability of computers and phones to do the same things for us, but Benjamin Redford is bringing it back…small time. 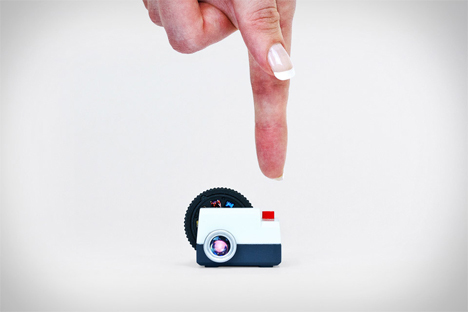 The Projecteo is an itty-bitty projector that fits in the palm of your hand. It links with your Instagram account for access to your most treasured photos. With your initial order of a projector, you also pick nine of your favorite Instagram photos. 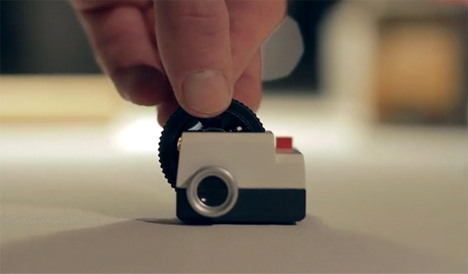 The Projecteo team develops those nine pics on a single frame of 9mm film in a circular formation. The slide is inserted into a black plastic wheel which fits neatly into the Projecteo. Then you just have to find a light-colored expanse of space on which to project your pictures. The pictures are surprisingly sharp for a device that looks a lot like a Barbie doll-sized toy. You can order new wheels (currently $8.99 each) any time you have some more memories worth preserving on tiny photo wheels. See more in Camera & Video or under Gadgets. October, 2013.